A few months ago I was given this DECAKER Micro Laser Engraver by GearBest to make a review and I have finally had some time to do it, so here it is. 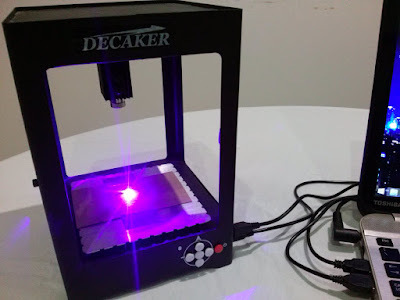 Starting with a few basic information, this engraver has a 1W laser head and the engraving area it's only about 38x38 mm, but enough for a laser engraving amateur like me, at least for now. That said, it won't work on metal, ceramics, stone or reflective materials, but it'll do just fine in wood, plastic, paper and leather. The engraver comes mostly assembled and is almost ready to use, which is certainly an advantage. Now this post is long overdue! And, since this year's Maker Faire will be in June, I think it's time to revisit last year's event. It took place on the 18th, 19th and 20th of September and it surpassed all expectations, welcoming over 14000 visitors! This was the second edition of the event and many things were improved since the first one, most noticeably the dropping of the "Mini" adjective from its name, being this second one a full scale Maker Faire. During my projects with single board computers with embedded Linux like the Raspberry Pi, the Beaglebone Black, pcDuino or the Cubieboard, often happens when I need to use and reuse SD cards to install Operating Systems into the boards. 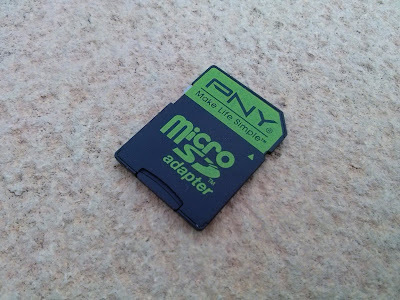 However, if later you want to use that same card as a normal storage unit, you might be surprised when you find out that a few MB or even GB are missing and worst, a simple formatting just won't fix the problem. This happens because the card was formatted to be used with a Linux partition and Windows simply doesn't know how to deal with that. Fortunately there's a tool for that. A few months ago I was browsing online through some 3D models for 3D printing and I noticed there was some DNA strands that caught my attention. They looked nice, however they were not really ready for 3D printing, at least for most printers. Still, I was moving them around on the browser and I realized they created an amazing upwards and downwards effect when rotating them. I thought, if it looked that nice on my computer screen, it must be even more hypnotizing if it actually existed. Then this thought came to my mind: what if I would print a DNA strand, and put it over a rotating platform and make it a lamp? And thus, the idea for this project was born. 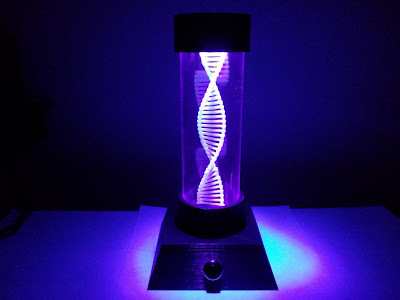 It was a good time to have this idea because, coincidently there was 3D printing contest happening on Instructables with some really nice prizes, so I thought about entering the contest with this project. Since I published a fully detailed tutorial of the entire project on Instructables, I won't get into details here. The files are available for download at My Mini Factory.